It’s been an important week, your first week of school. Junior Kindergarten. Such a big step, but for you, who were so ready (even though you’re not yet four), the most natural thing in the world. When you first visited your class in June, you were really proud of how you walked right in, and Mummy went away for the whole hour… “And I was totally fine!” The same was true for your other hour-long visit last Friday, in your real classroom with the senior kindergartners there: you did school like a pro. Leading up to your first full day, you were nothing but excited. You were counting down: “I can’t believe the day after the day after tomorrow I’ll have my first full day!”, “I can’t believe the day after tomorrow…” and so on. This past Monday, we had our last official “Mummy Day.” I was entranced listening to you play in your bedroom with a family of hair clips… They are the kind with jaws, so they can talk, hug, exchange fond words. There was a Father clip, two daughters who are tiny clips, and one in two pieces that you dubbed “Little Broken.” We played and had lunch and read stories. We had a lovely, mellow day in which I got all nostalgic (though I kept it mostly to myself). I’d say you spend at least eighty percent of your time pretending. Sometimes you’re a character (Elsa or a kitty or Hermione or a grownup lady). Sometimes I have to be a dragon for a few seconds so your stuffed unicorn can cure me back to being human. Sometimes you’re busy mitigating the trouble your best imaginary friends (Golla and Sparkles) are getting into. Sometimes it’s your own kids (Asuna, Anuna, Alella, and Sybo) who are up to shenanigans. Sometimes you’re taking business calls on your defunct flip phone. Sometimes you’re singing in your own language. Sometimes I’m your daughter and you’re my mom (and you get to call me “Dinah” in satisfied tones). Sometimes you’re building schools out of MagnaTiles and populating them with your small friend toys (family of fairies, family of monkeys, family of turtles, etc.). Being bored never even occurs to you. Your imagination keeps you fed. It’s awesome. On Tuesday, your first full day of JK, I got to accompany you to school, along with both your aunts. You had picked out your outfit in advance, and you were so confident and adorable we could barely stand it. You gave us all hugs, and you let the teacher show you where to line up, and you trooped right in the door with total poise and trust. 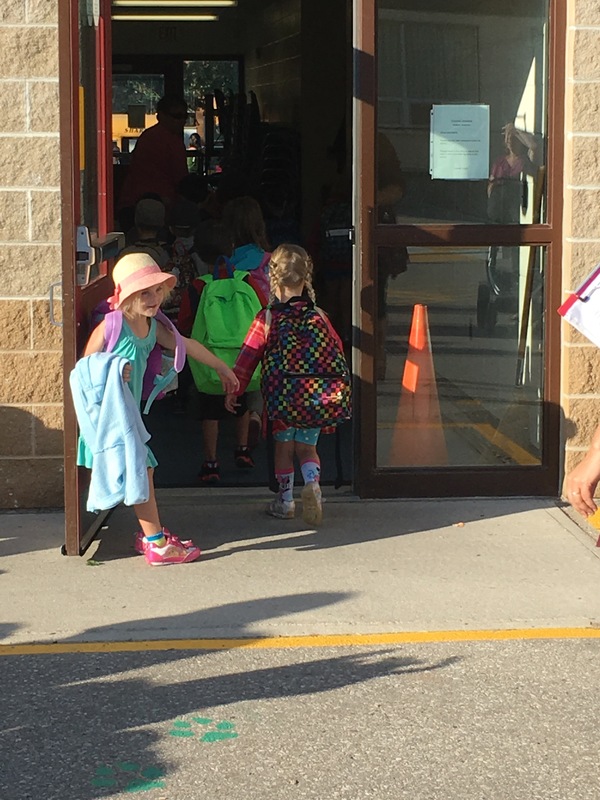 I’ve seen a lot of small kids at drop-off time, and many, many of them have trouble saying goodbye. I know you’re brave, but I was still impressed – and a little surprised. In truth, on that first day of school, after you’d hugged Auntie Emi, you wiped one eye, but you were so composed that it might have been a head-cold tear rather than a sad one. On each of the four days of school, you were happy at drop-off, and happy at the end of the day too. If you’ve had sad moments at school, you’ve never mentioned them (although you have said, on two days, “I missed you today,” but not in a tragic way). 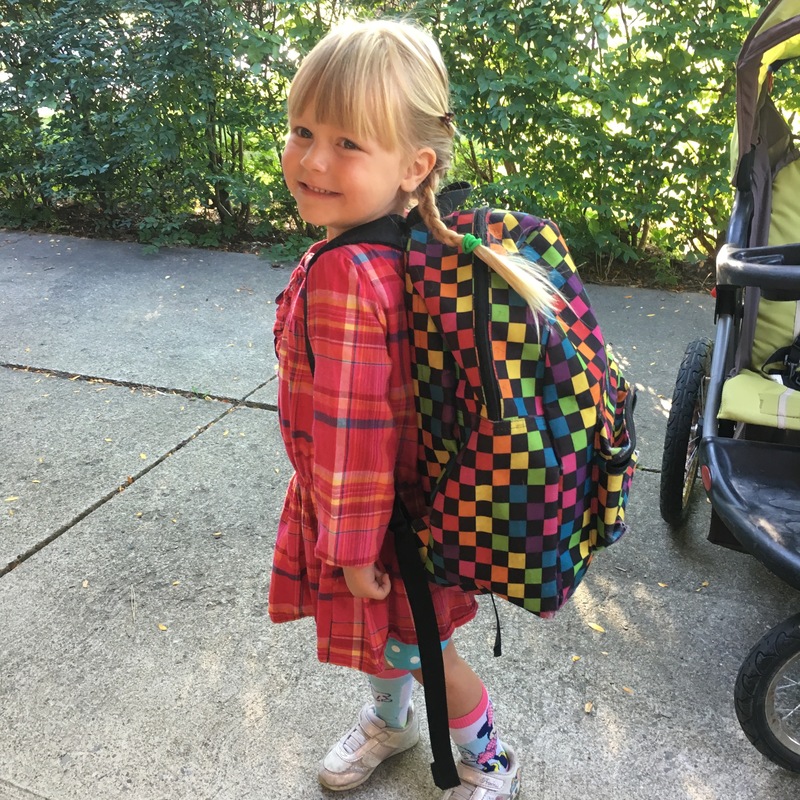 I, on the other hand, got all weepy on Wednesday evening, having to admit to myself I was having some withdrawal after so much kid-time this summer – and fully realizing that my baby is in school, and things will never be the same. I miss you already. There’s no question that you’re tired. There have been lots of meltdowns in the evenings this week, compared to over the summer. Some rebellious behaviours are intensifying as you test boundaries – and as fatigue makes rational decisions more elusive. We try to get you to bed earlier and earlier, but it seems you could always sleep more. I hope we’ll soon find the right groove for you to be rested. Still, you are eager to go to school. You say, “All I do is sing songs and play and have snacks!” And there are lovely things in your classroom; when we asked you about your second day, you said with delight, “I discovered something that was new to me: a basket with a pegasus inside!” And you’ve made some friends and learned some names. You’re happy. I wish there were a way I could witness you in your new environment. I wish it could always be this way. You are full to the brim of sheer you-ness. You are fierce. You mean business. You’re imperious, eloquent, wise. You possess a degree of empathy that’s unusual even in older children. You also have buckets of snuggly affection to spend on those you care about. Your dancing is of an earthy lyricism that must be seen to be believed. You love to look at yourself (especially when accessorizing) in the mirror; Daddy and I say nothing, because although we hope you won’t obsess about your appearance, we also know there will come a time when you look at yourself and don’t feel the pure pleasure you do today. You are beautiful in so many ways, and right now, you really know it. Sometimes I involuntarily imagine the things that will bring you down from this place of innocent clarity. I want to cry when I think of the people and the pressures that will make you doubt yourself, or tell you you’re un-beautiful, or bring shame into your self-concept. The world, for all its progress, can still be a cruel place, especially to women and girls. I know you have to be challenged and hurt to grow strong – but I still cringe at the thought. I hope the confidence you have at this moment will survive to get you through the hard times. Oh, my little girl. In less than two weeks, you’ll be four years old. I could not possibly describe how much, or how ferociously, or how tenderly I love you. Please just remember it’s true. Pretty much describes the way I felt about you going off to school — more than a year older! And only for half-days! I rather wish it were still like that, even though I know most kids are in day care all day even before they enter school… Even though AB’s doing well, and kindergarten is play-based, I still wish kids could wait longer. They are long days. What a vivid portrait of your bold and beautiful daughter (woman-ette of steel!) – she is an amazing original. Not one word of this surprises me. Her imaginings remind me of my daughter – who had a ‘sword’ with which she turned fire-breathing dragons into peaceful ones. Her children sound like folk-tale children – Sybo would be the one Mama does not call, but who saves the day. Aww, your little sweetie with her peace-sword… That’s SO GREAT. And yes, I’m sure you’re exactly right about Sybo! What beautiful memories – I’m sure she will just love reading these words about her when she gets older! I so hear you on every level regarding the breaking down of their “innocent clarity” and the harsh realities of the social world. I remind myself that resilience does not negate kindness. Sounds like this well-adjusted young lady has a great starting point. Beautiful post, Di. So full of love and momminess and pride. She’s such an amazing little girl. Love you too, so much!